Historic New Harmony invites schoolchildren to New Harmony, Indiana, April 16-18, 2019, to experience what life was like in the 1800s through the eyes of a variety of period artisans. This year we welcome back artisans who specialize in paper marbling, wood carving, beekeeping, tinsmithing and weaving, to name just a few. Albert Roberts, who previously conducted the 1800s doctor presentation, will be giving a new, interactive demonstration on shipping featuring travel, trade and warfare in the early 1800s. The demonstration will focus on the roles children played on these vessels by using an interactive game. 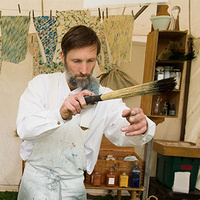 Rain or Shine Policy: Heritage Artisans Days will happen rain or shine. There will be no refunds for cancelations. Please have students bring appropriate clothing for the weather.